This bear made sure everyone knows he doesn’t like being filmed. Turns out grizzly bears don't really like cameras! 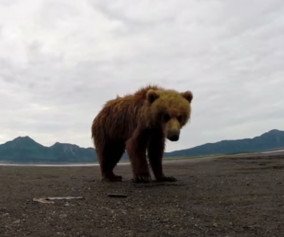 In the video below you see the bear spending a good deal of time investigating a GoPro before finally deciding he doesn’t like it and slaps it with his giant paw. The GoPro was put there by naturalist, who was working as a guide in Alaska for BBC film crew recording Great Bear Stakeout. Watch this bear not taking any nonsense here.